The iPad Pro, or Is It? After a week I can say without reservation that I am loving the iPad Pro. I haven't used my notebook since I've had the iPad Pro, and haven't yet missed it. I have put it up for sale. So it is fair to say that I am all in on the iPad Pro. What I am not all in on is how it is positioned in the market. What Does It Mean to Go Pro? One of the few career days I remember from school has stuck with me my entire life since then. They brought in a professional trombonist especially for me. I was a promising musician who happened to play the trombone. I don't remember his name. But I did spend a lot of time with him that day. I asked him a variation of the question I am asking now. What does it mean to be a professional trombonist? How do you know you are a professional? Is it when you reach a certain skill level? Is there some sort of certificate you receive from the secret guild of trombonists? What exactly does it mean to go pro? He thought about it for a while before returning the answer, "It's when you get paid to play the trombone." I did go on to get paid to write music, sing, and play the piano. So I can say that I was a professional musician at one point. But I was never paid to play the trombone. I was never fully satisfied with that definition. But lacking anything better, it has stayed with me to this day. At this point in my writing career, I have been paid by no less than four entities to write for them. I receive a regular paycheck from one of them: my current employer. Whether or not my writing skills are at the highest level is beside the point. In every way that matters, I am a professional writer. Does that mean that everything I write is professional? Or that every tool I use for my job is a professional-grade tool? Even now, I have no idea what "professional" means in the context of a product. Since 2010, we have had the iPad. Apple has never considered it a professional device. Yet millions of professionals used it everyday to help them complete professional work. Apple launched an iPad project with iBM with the standard iPad. It is hard to get more professional than IBM. Now, Apple is touting a new iPad as being Pro. Were we mistaken about the last iPad? Was it not Pro? People were already making money with the iPad. So what changed? I don't like the idea of delineating people by class. There is no such thing as a consumer vs. a prosumer vs. a professional. All of us are all of those things all of the time. I consume TV shows for entertainment when time permits. I dabble in audio and video production when I'm in the mood. And I write for a living. I do it all on the same set of devices. I can't be categorized as any one thing. And neither can you. The same is true for the devices we use. When you are talking on your phone for business, is that phone a professional device? What about when you are crushing candy on that same device? Now, what is it? These classifications are marketing terms with no intrinsic meaning. The iPad Pro should not be considered a device that is exclusively for professionals. It's not. The iPad Pro is for anyone who can benefit from the functionality it offers. We are all the same user. We just have different needs, and use different devices to fill those needs. Whether or not you can use an iPad Pro has nothing to do with whether you are a professional anything. It does not have to be a part of your money-making workflow. You don't have to put on a suit and tie to get the most out of it. The "Pro" in iPad Pro is nothing more than marketing classism. Forget about it! This is not a complete list. But it gives you an idea of what makes this iPad a premium affair. Who Can Benefit from Owning an iPad Pro? Gamers - Whether you play shoot-em-ups or pretty puzzlers, the iPad Pro will offer you a better gaming experience due to its bigger, brighter, more beautiful display, and the blindingly fast processor that drives it. Put it on a stand and use a game controller for a console-like experience. The Visually Impaired - Like the iPhone 6 and 6 Plus, the iPad Pro has a Zoomed mode for the display. That means that you can make everything on the screen bigger, rather than having more things on the screen. In that way, it is not just a large iPad; it's a large print iPad. TV watchers If your TV watching is less the network variety and more the Netflix variety, the iPad Pro is probably the best screen in the house. Emailers, texters, tweeters, Internet commenters, and Facebookers - Basically, anyone who does social networking and short-form communications over the Net should benefit from the split-screen multitasking of the iPad Pro. Multitaskers - For the same reason as above, anyone who likes to do more than one thing at a time on their iOS device will find the iPad Pro's large screen luxurious when using two full-sized apps side by side. Other iPads can do this. But it is so much better on the Pro. Writers - When I am not writing for a living, I write for fun, like now. The class of keyboards made for the iPad Pro are worlds better than the keyboards for the traditional iPad. Full-sized keys with no compromises means the typing experience is the same as on a 13" notebook. The ability to do that writing with two apps open at the same time is fantastic. Keeping a research window, or social media window open at the same time is fantastic. People who like to draw and ink - Everyone from professional artists to sketching enthusiasts are going to want one of these along with the Apple Pencil. If you like to take handwritten notes, this is as close is it comes to writing on paper in the digital age. It's biggest feature is also it's biggest drawback. 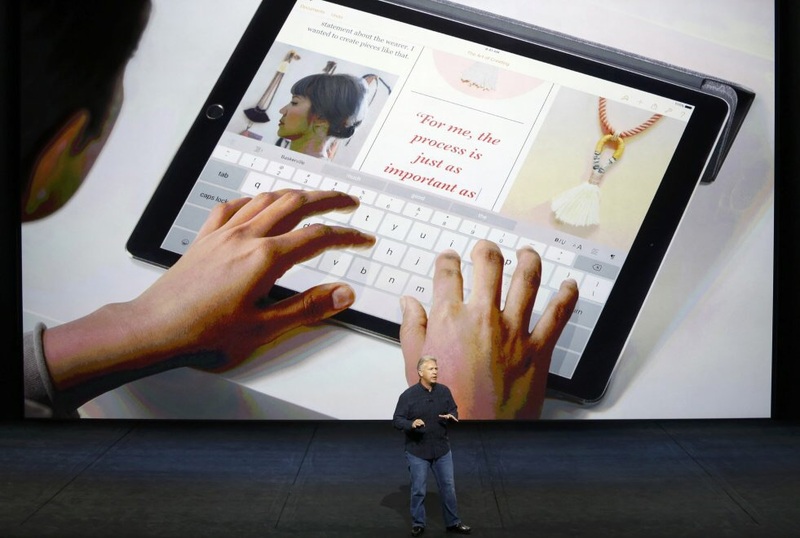 The iPad Pro is big. Just about every review begins and ends with this fact. You might think you are prepared for the size of it. But you are probably not. A 13" laptop screen doesn't seem that big when you are using it. But if you could rip it off and hold it in your hand, you would feel differently about it. The iPad Pro is a lot more than the screen, it is also the CPU, GPU, battery, speakers, everything. The screen on your laptop would be a lot thicker and heavier if it had to accommodate all that. The screen on your laptop is also permanently affixed to a convenient hinge. So you never have to pick it up and hold it. The iPad has to be picked up and held. You will definitely feel the weight of it. It is no trivial matter to hold it for an extended period of time. You will have to constantly change your grip to avoid strain. I count off a few points for the iPad Pro's lack of a built-in kickstand. I didn't think the regular iPad needed one because it could be held for an extended period of time. This iPad is definitely intended for extended use. And it is too big and heavy to hold for that extended use comfortably. Therefore, it really should have some mechanism for holding it up. Apple's solution is for you to buy a smart cover. For this device, a smart cover or keyboard is not just a luxury, but a necessity. To carry it around, you are going to have to go to a laptop-style solution. Those little iPad pouches are not going to cut it for this. This is a 13" screen. It is a lot of exposed glass. You are going to need a laptop case or backpack for safe and convenient transit. If the iPad is a "Pro" device, then so are the trade-offs. You will have to make the kinds of compromises that professionals have to make to accommodate their tools. If you can handle that, then this may be the device for you. Every benefit is balanced by a trade-off. Be sure that the benefits and trade-offs are right for you.